Ghana has been undergoing transformational changes in its healthcare financing over the past decades. Among other developments, the National Health insurance Scheme established by National Health Insurance Act 2003 (Act 650) replaced the “Cash and Carry” system during this period. The primary objective of the scheme is to ensure financial access to basic health care services for residents without having to pay out-of-pocket at the point of health care service delivery. 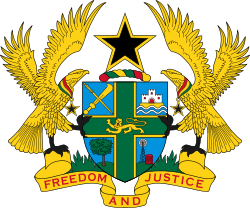 The National Health Insurance Scheme has become an integral part of Ghana's strategy to move towards universal health coverage. The active subscriber base of the NHIS as at December 2014 was 10.5 million. Over 29 million attendances at healthcare facilities were made on account of the NHIS in 2014. Currently, 69% of NHIS registered subscribers are exempted from paying premiums. These include SSNIT contributors and pensioners, persons under 18 years old, persons 70 years old and above, pregnant women, indigents (the core poor), persons with mental health conditions, categories of disabled persons designated by the Minister responsible for Social Welfare, as well as beneficiaries of the Livelihood Empowerment Against Poverty Programme (LEAP). These exempt categories count for close to 69% of registered members of the scheme, and as a consequence only an estimated 31% of members pay contributions, which contributions are also not at fixed actuarially determined rates. Revenues emanating from contributions collection over the years form a relatively small proportion of NHIS inflows, accounting for 3.4% of total revenue in 2014. The NHIL contributed 73.8% of total revenue while SSNIT contributions accounted for 20.4%. From fragmented pools of funding prior to 2012, the scheme now operates a single pool of funds from which services are procured from providers and administrative and operational expenses covered. The NHIS benefits package is anecdotally estimated to cover 95% of disease conditions reported in Ghana, with services ranging from primary curative care to care at tertiary facilities for all enrolled persons without co-payments or usage limits of any kind. In a state driven social intervention program such as the NHIS, where the Scheme is funded mainly through tax revenues and statutory deductions, the country’s health goals ought to guide the design of the benefits package. Furthermore, the tax-paying population should be able to perceive the benefits package as valuable in order to sustain their support to the NHIS. The needs of the poor being stressed. A scanning of the literate leading to the establishment of the NHIS however does not show any significant evidence that such rigour was taken into account. 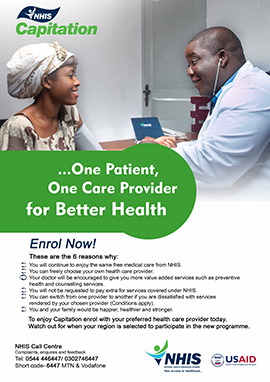 Purchasing of health services within the NHIS is mainly through fee-for-service and diagnosis related groupings, with capitation being piloted in the last couple of years in the Ashanti Region, and currently being scaled up in three additional regions from July 2, 2015. Methods of paying providers have had an effect on provider behavior within the NHIS. Accordingly, payment methods have to be carefully selected and implemented in a way that incentivizes providers to exhibit appropriate behaviours and reduce the risk of perverse incentives. Moral hazards facing the scheme in the form of fraud and abuse have been estimated to be losing the scheme anything ranging from between 5 and 10% of claims costs. Initiatives by the NHIA such as centralized claims processing, clinical audits and linking of diagnoses to treatment, to mention a few, have had an effect of reducing the prevalence of fraud and abuse, but more needs to be done. In recent times, high and increasing claims costs have placed the scheme under severe financial pressure. This has contributed to the scheme’s inability to pay claims in time to healthcare providers for services rendered to NHIS subscribers. This is in part due to an increase in the active membership of the scheme, as well as an escalation in medical costs, especially the cost of medicines. Indeed since 2005, the cost of providing health care to NHIS subscribers has increased much faster than the financial resources allocated to the scheme. The NHIS has therefore experienced persistent and increasing annual deficits since 2009. Delays in reimbursing providers have on several occasions led to the withdrawal of services to NHIS subscribers by providers. It has also led to unauthorized copayments and denial of service to NHIS subscribers which has had the effect of lowering confidence in the scheme. On the side of the costs of operating the scheme, concerns have also been raised by some. In some quarters, it is felt that the scheme should have a lean and efficient operational structure. In other quarters, it is felt that the legacy of the heavy administrative and operational structure bequeathed by the previous structure had yet to be fully rationalized. The foregoing and several other factors have led to calls from stakeholders for the scheme to be reformed. Indeed, with the strong commitment shown by Government to a robust NHIS and Universal Health Coverage, the time is opportune for such a reform to be undertaken. Change Management and Communication Strategies: Develop change management and communication strategies to support implementation of the proposed recommendations. Power Point Presentation, Presentation to His Excellency the President, Minister for Health and other selected persons on the Final Report. The Advisory Committee will consider and make recommendations on the draft report submitted by the Technical Committee. The report will be considered at a two day workshop with the option of members sending in written comments if they are unavailable.